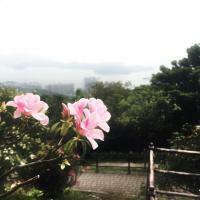 I am posting here as I have no permissions to do so in other forum boards and because all of the several other topics on the same subject have been closed, in spite of no adequate response being posted. 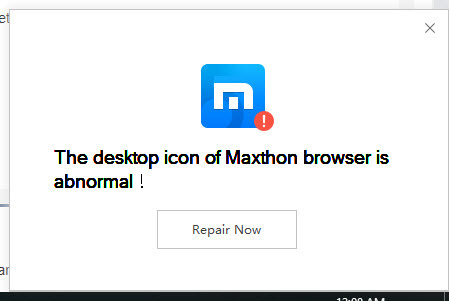 Maxthon, even when not running, frequently pops up a message that says the desktop icon is abnormal, with a repair option. Several replies in other threads have suggested this is a Windows message; it is not. No application has the right to dictate what my Windows configuration is, it is invasive and poor etiquette. This should not have happened in the first place, but as Maxthon has chosen to ignore all of the previous posts to this effect I have lost confidence in the integrity of the product and uninstalled it. Recently I started having message that Maxthon desktop icon is abnormal??? After repair it is OK for a day or two and message comes back. Merged with older thread that shows the error. Has been discussed many times before, no "fix" apart from leaving the icon on the desktop or using portable version. Just don't "repair it"; click the X in the upper right corner to close it. I change the name of the icon to indicate which version the icon represents ( as a tester I have several versions installed and icons for each one; if I didn't change their names , I would have a bunch of MX5 named icons and wouldn't know which one is which). As such I see the message after installing and changing the icon every time. If I would choose to repair it, it reverts back to MX5, which I don't want, so I just close the message box and that seems to work to make it go away and my icons stay as I have changed them. I agree that the wording of it being "abnormal" is misleading and probably the result of a translation and I also don't know why those that have chosen to not place an icon on the desktop during installation are seeing this message, though I am guessing that if the icon was originally there and then deleted, this message will appear. But I don't agree at all with NickC4555's opinion about the integrity of the product.